It’s that time of year when we need to get serious about one very important thing: hot chocolate! I’m not a fan of temperatures below 70 degrees (maaaaybe high 60s is okay) and indulging in really good vegan cacao hot chocolate is one of the small ways I make cold late-fall and winter days more enjoyable. 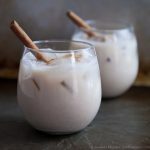 This almond milk-based cinnamon cacao hot chocolate is Aaron and my go-to dessert at least a few times a week, usually enjoyed by our fireplace in the evenings (one of the best things about our condo) but sometimes in the afternoon when golden hour happens at 3pm and I’m seriously dragging. You can use regular cocoa powder, although we like it best with rich, raw cacao powder. Raw cacao is great because it’s alkalinizing and brimming with antioxidants, and it tastes even better with a generous sprinkle of cinnamon, a splash of vanilla, and a little pure maple syrup to sweeten it up. I add the ingredients straight into my saucepan, whisk to combine, and then heat it on the stove. It takes five minutes, and hooray! There’s only one pan to clean. 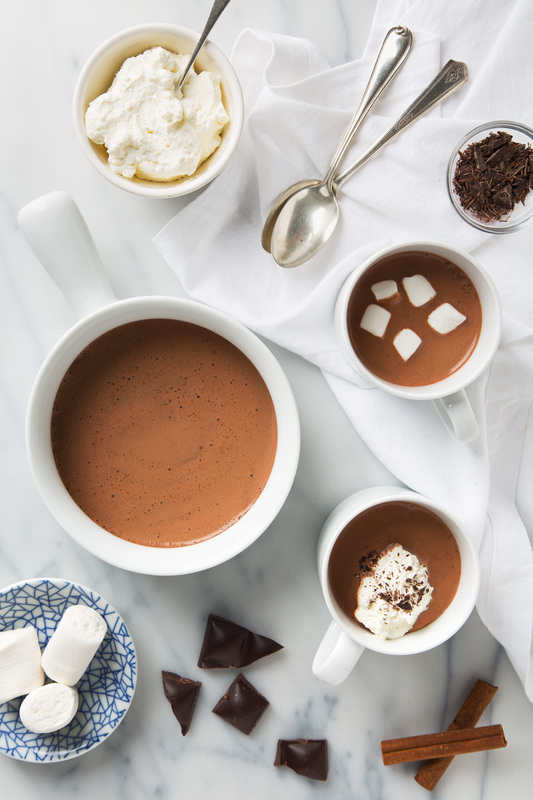 You can enjoy your cacao hot chocolate as-is, dress it up with a few vegan marshmallows, or add a dollop of coconut whipped cream and some dark chocolate shavings. I love the coconut whip and chocolate shavings combo, although I have a sweet spot for those cute mini marshmallows too. 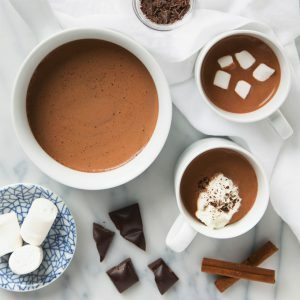 Simple 5 ingredient vegan cacao hot chocolate made with rich chocolate and spiced with cozy cinnamon. 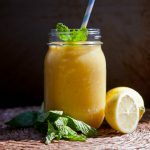 This is my go-to recipe when I want something easy and decadent while still being naturally sweetened. 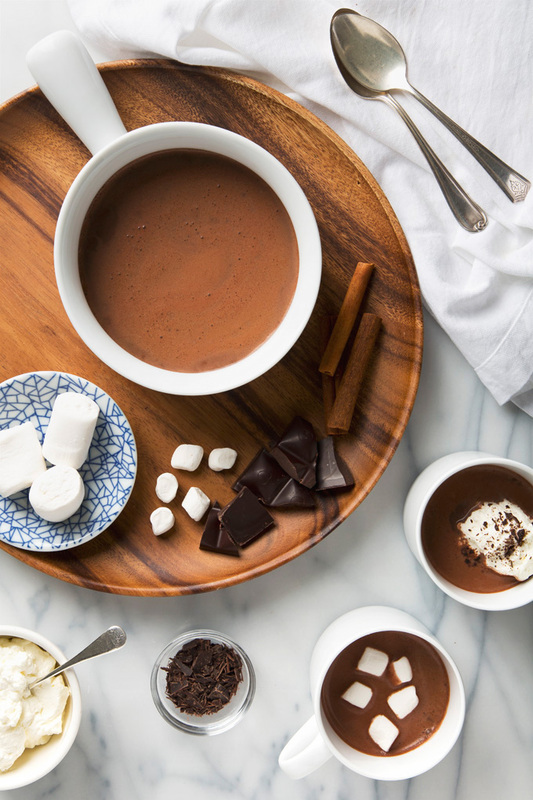 Add all of the hot chocolate ingredients to a medium saucepan and whisk to combine. Warm over medium heat, whisking occasionally. Taste and adjust the sweetness if desired. Serve with marshmallows, coconut whip and/or dark chocolate if you like. For the marshmallows, I usually buy Dandies brand, but Trader Joe's also sells vegan marshmallows in regular and mini sizes (and I'm pretty sure they are Dandies too)! I hate the cold too. I moved to Palo Alto a couple of years ago from Minneapolis and the warmer temperatures suit me much better. Maybe a move to Cali is in order? 😉 This “fancy” hot chocolate sounds fantastic! 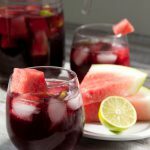 This looks like such a luxurious (and healthy!) hot chocolate! I’ve been looking for ways to use up a big bag of cacao that I bought for a cake recipe and this sounds perfect! I’m going to make it tonight. I love adding a dash of cinnamon to my hot chocolate, and sometimes a bit of orange zest. I’m betting the latter would be great in your recipe. Yes! Orange zest sounds SO good! This was so good! I used coconut milk from a carton (not a can) instead because I didn’t have almond milk and I also added a little almond extract. It was wonderful. If there’s one good thing about the cold, it’s that we can indulge in a good hot chocolate without feeling guilty! I’m a big fan of topping it with coconut whipped cream, too! I just made your cinnamon hot cocoa and it was the BEST hot chocolate I’ve made / tasted, um, ever. Who knew that such a simple recipe would beat out all the others? THANK YOU. Your comment made my day, Carly! Thank you!! Thanksfor the perfect recipe! This looks so yummy and delicious! I’m definitely going to give it a try! Lots of love!